A 20-something reporter from Tennessee said she teared up after voting today. She said she was proud of our president — finally, for the first time in her adult life. And as I drove to Oakland, it was obvious she wasn't the only one. One city over, a crowd of people were counting down the seconds to 8:00, when results would be announced, at the Democratic Club in Alameda. But I walked in the door as it came up on the screen: Barack Obama was our next President. Everyone cheered. Several people wiped their eyes. My cell phone rang — it was my girlfriend — but I couldn't call her back, because cell phones stopped working everywhere, because everyone was already calling their friends with the news. "President Obama," someone said. "I told you. President Obama." "The whole country is calling each other." A black woman in a dirt-colored windbreaker watched to the left of me. She had a birth mark on her face, and her hair was pulled back in a frizzy pony tail. "I never had a doubt," she said. "I never had a doubt." A young black boy smiled, held his arms over his head, and said "Yes we can." "Yes we did," someone said. People were jumping up and down, and there was hugging. Most of the people in the room were white, and mostly young, but I saw an older blonde woman with a big necklace around her neck. She was tearing up. So was an older guy in a baseball cap. So was the woman in the pony tail who'd said "I never had a doubt." So was I. At the side of the room was a smiling cut-out of Barack Obama. "California made him win," someone said. "California is what did it." A woman raised her fist over her head. "Obama, y'all!" On the street, I heard a stranger shouting "Obama. Whooo!" And then I left to drive to a celebration party at Everett and Jones, a big barbecue restaurant near Oakland's Jack London square. At the restaurant, people had screamed when the victory was announced. A news crew filmed people jumping, hugging, waving flags, dancing, and weeping. "Thank you Jesus," the restaurant's owner said, over and over again, clapping her hands. "400 years! We won!" "I wish my mother and father was here," another woman said. "My mother always worked at the polls, and she always told us to vote. And to believe in ourselves." Near the restaurant, one street had been blocked off, where a band was performing. There were small balloons woven into an arc — red, white, and blue. Cars drove by honking. Even a truck honked its horn. One honking jeep drove by with two American flags. I heard later they were honking horns in Washington D.C., and in New York. All across America, horns are honking. Three hours later, I'd hear horns start honking again. A black guy stood at the side of the street dangling an Obama t-shirt to the passing crowds. Later he started dancing — squatting and then kicking. I saw a black kid on his parents shoulders waving an American flag. I had trouble finding parking, and the barbecue joint was so packed it was nearly impossible to move around. The TV showed a shot of Sarah Palin, and some people booed and held up downturned thumbs. We couldn't hear McCain's concession speech, but were only seeing his expression. Someone said that "He never had a chance." I saw two black women leaving the crowd. Their eyes looked moist, and that made me mist up too. A young white woman from the Oakland Tribune asked me questions about the election — are you excited? What do you expect Obama to do? What's the first thing you're going to do tomorrow? I started to say that I'd watch everything tomorrow that I missed tonight — that it seemed sad to watch TV tonight when you could be out with the people. I told her I'd been there when they'd counted down to 8 o'clock, and when they'd said Obama was President. I choked up. She thanked me, and moved to someone else. "This is history right now, Oakland," a woman said from the stage. "This is what we do." Everywhere I looked I saw cell phones and PDAs. Everyone was still calling everyone else. I found the line for barbecued food — but it was long. After I'd waited for five minutes, I saw the man in front of me greeted by one of his friends. They were both black, and the friend said "I'm so proud. This has been a long, long coming." He didn't say "time" — just a long, long coming. A reporter from the Oakland Tribune was interviewing a grey-haired black man behind me. Five minutes later, they were still talking. A lot of the crowd were proudly wearing Obama t-shirts. I saw an "Obama on the cover of Time magazine" t-shirt. And an "Obama on the cover of Ebony" t-shirt. One shirt just said "Black man running, and it ain't from the police." There was a bright light in the sky. It took me several seconds before I realized it was a helicopter sweeping the crowd. Everyone cheered and waved. Three different people held their hands over their heads, making the "O" sign. A younger man with dreadlocks and a goatee said "I never really thought I'd see something like this happen in my lifetime." 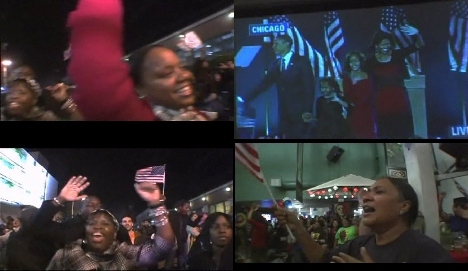 A local news crew filmed him saying Obama had the support not only of African Americans, but everybody. "So America can be what it's destined to be —a melting pot." A woman from the restaurant was cooking dozens of big dinner sausages on a wide outdoor grill, wearing a sequined "Uncle Sam" hat. The band sang a funk song. I got you in my arms." I heard the reporter from the Tribune say he was out of ink.